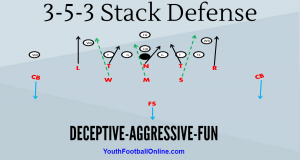 The the 4-4 defense is a balanced defense that features 4 defensive linemen (2-defensive tackles (T) and 2- defensive ends (E)). The back seven include four linebackers and three defensive backs (SS is a hybrid/monster type player). You can play a variety of different coverages behind these blitz packages. 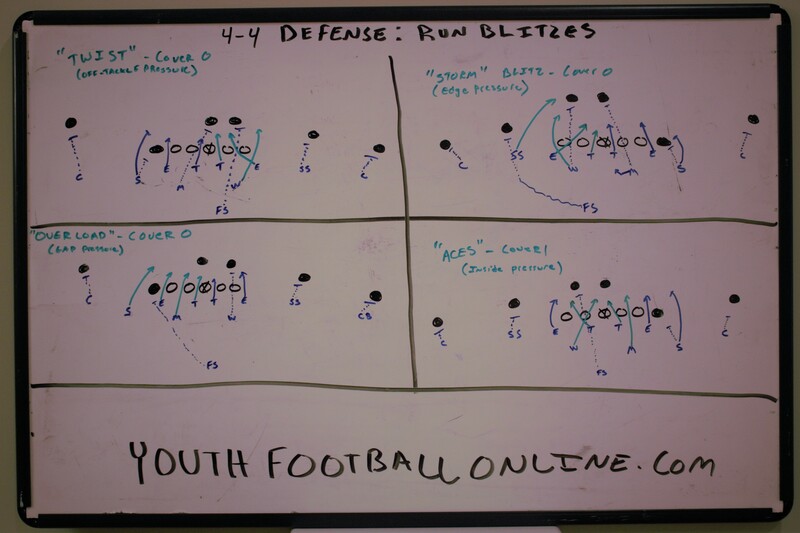 These 4-4 defense blitz packages are drawn up with the defenders playing man to man behind the blitz. These blitzes play cover 1 or cover 0 ( no safety) behind the blitz. However, you can absolutely play zone coverage with these 4-4 defense blitz packages. Cover 3 behind these blitz packages works very well and will help prevent any big plays. Below are some excellent 4-4 defense blitz packages. These packages include four different blitzes: “Twist”, “Storm”, “Overload”, and “Aces”. This blitz is best executed to side without the tight-end (TE). E: Slant C-gap, dip and rip through the offensive tackle’s inside shoulder. SS: Man to man coverage on slot receiver (3). On a run play, he must support contain. S: Man to man coverage on the (TE). On a run play, he is the backside contain player. W: Slant outside past the offensive tackle, C-gap responsibility. M: B-gap. If it is a pass play, he spies the QB (if he is a run threat). CB: Man to man coverage on (4). FS: Man coverage on the half-back (2). SS: Show man to man on the slot receiver (3), cheat inside, blitz off of the edge on ball movement. Must maintain outside leverage. S: Man to man coverage on the tight-end (TE). Contain player against the run. W: B-gap. If it is a pass play he spies the QB (if he is a run threat). CB: Man to man coverage on the (4). CB: Man to man coverage on the (SE). FS: Man to man coverage on the (3). SS: Man to man coverage on the slot receiver (3). S: Blitz off the edge, contain. Must maintain outside leverage. W: B-gap on run, man to man coverage on half-back (2). CB: Man to man coverage on outside receiver (SE). CB: Man to man coverage on outside receiver (4). FS: Man to man coverage on the (TE). E: C-gap, contain (no TE). SS: Back-side contain on run, man to man coverage on TE. S: Man to man coverage on slot receiver (3). CB: Man to man coverage on the outside receiver (SE). FS: Man to man coverage on half-back. If half back blocks, the (FS) will take deep middle. Turns into cover 1. When you call a blitz, the defenders must blitz hard! Half-hearted blitzes will lead to you giving up big plays. You can live by the blitz, but you can also die by the blitz. All blitzing defenders need to creep up as soon as the QB begins his cadence. They need to be right on the line as they blitz. As soon as the ball moves they attack. Make sure your blitzing defenders aren’t blitzing for 4 yards back. Make sure you take into account the offense’s formation before blitzing. Also, understand that blitzing from the wide side takes away the field, but it will leave you vulnerable for quick pass route concepts to the wide side of the field. Blitzing from the boundary is safer. There isn’t much room for the offense to work to the boundary side. We will almost always send our outside backer that is on the boundary side. You can have your cornerbacks give cushion, or you can have them up in press. You can play cover 3 behind the blitzes. This will give you 3 deep defenders which will help prevent big plays. Quick passing game. Slant-arrow, split screens, smoke/tunnel screens. Blitz strategically. Blitz based on scouting. If you blitz all your defenders inside and the offense runs outside, you will be in trouble. Be careful not to blitz you defenders out of position and out of the play. Motioning and running jet sweep away from the blitz can hurt these packages. No huddle offense. It’s critical that the defenders don’t show blitz until the QB begins his cadence. If a no-huddle offense sees you are blitzing they can call a play that can beat the blitz. Most of these blitzes leave no safety deep, so your defenders better be able to play good man to man coverage.